If your electronic car key has stopped working, don’t panic. Remote or transponder car keys can stop working due to a dead remote battery, damaged or lost transponder chips, impact from being dropped or exposure to water. IS IT POSSIBLE TO REPROGRAM AN EXISTING KEY? In most circumstances, we are able to reprogram the malfunctioning key for the vehicle. Sometimes, however the damage can be too extensive and we create a new key. A transponder key works by matching an electronic message from the original key to an electronic message in the car’s engine control unit (ECU) in order to disable the vehicle's immobilizer and start the engine. When a key is reprogrammed with a programming unit, all the keys that used to be programmed to the vehicle will no longer work. If the key or remote is wet or damaged, we will most likely be unable to reprogram the key or remote. If the remote has a dead battery, the battery in the remote will most likely work again after the change. Once we are on site, we can evaluate your car key programming need and offer you the best price for the service necessary. If we are unable to reprogram the key, we can create you a new key or unlock the car. Anytime you need us, we’ll be there! 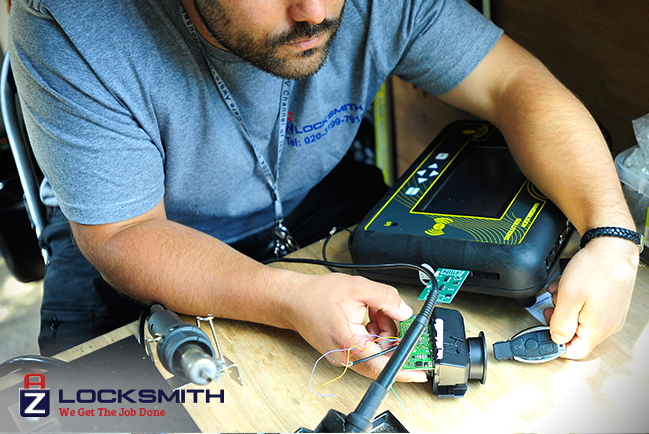 AZ Locksmith offers around-the-clock service for whenever your key stops working. There never needs to be any worries that we won’t be available. Our services are available 24 hours a day, *365 days a year*, so whether you get stuck at the office after work, or can’t leave your house in the morning, AZ Locksmith is available to help you out!